Here are some of our favorite ways to make the most of a small bathroom. Your home’s bathroom can be a hideout from the hustle and bustle of every day. No matter how many bathrooms you may have in your home, they should ideally all catch that theme of escape. But is it possible to relax inside a small bathroom? 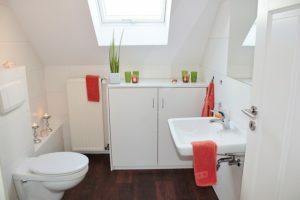 A smaller bathroom can feel much more cramped than it is really is, which can be anxiety-inducing, to say the least. Here are some of our favorite ways to make the most of a small bathroom. The colors used inside the bathroom can change how we see the bathroom itself. Use more neutral colors, or choose pastels. Both of these shades can help make a small bathroom feel larger. While some might say these colors are boring, that’s not the case! You don’t only have to use pink or beige. For an aesthetic boost, consider adding brighter towels or other elements to your bathroom to give it an eye-catching new look. Much like color, the lighting in a room can also change how we see a room. Don’t go with larger fixtures like chandeliers, since these lights demand too much space when space is already at a premium. Instead, take a chance on recessed lighting. Recessed lighting fits unobtrusively in the ceiling. That comforting soft glow from the light can also make you feel as though the bathroom is bigger, too. Pick wider windows or even skylights to let more natural light in, which can lift your spirits as well. Mirrors create another optical illusion when it comes to the size of your space. The bigger the mirrors are, the better your bathroom looks. Instead of using medicine cabinets that stick out, go with flat ones. Not only will you save some much needed space, but it will open up the room that much more. While a vanity sink might seem like an obvious choice, they also take up a lot of available space. Try a pedestal or wall-mounted sink instead. The one drawback to using these models of sinks, however, is that you might be sacrificing storage space that can come in handy. This entry was posted on Friday, March 22nd, 2019 at 9:05 am. Both comments and pings are currently closed.